Straint helps clients in highly competitive industries understand competitors’ and other players’ reactions to changing market conditions and industry dynamics. As a highly specialized consulting company, we take these strategic interactions into account when developing and analyzing strategies. A new competitor enters your market and you ask yourself: What are the opportunities and threats from this situation, and what implications does the new situation have for our current strategy? How should we modify our positioning, segmentation and product/market strategy? You’re evaluating a major investment: Will investing in expanded capacity pay off in the long-term at future prices, and which expansion path is ideal in the new market dynamic? Which price strategy is ideal when facing this situation? Your business is facing a number of potentially disruptive scenarios. They all seem to be crucial for your business. However, are they likely to occur, and which of them is most impactful? How would the market and your competitors react? Furthermore, how should you position yourself, anticipating this. See section Publications > Videos for full video. Straint’s approach to analyzing strategic interaction helps you, as executives, find answers and make the best fact-based decisions, taking upside potential and downside risk into account. First, in our analytical wargaming simulation, we analyze the issues at hand using proven analytical game theory and wargaming concepts. By using highly sophisticated, customized tools for analysis and simulation, we test all outcome scenarios of action-reaction chains and deduce stable and likely results of the decision at hand. In doing so, we calculate and test literally thousands and sometimes even millions of possible outcomes. 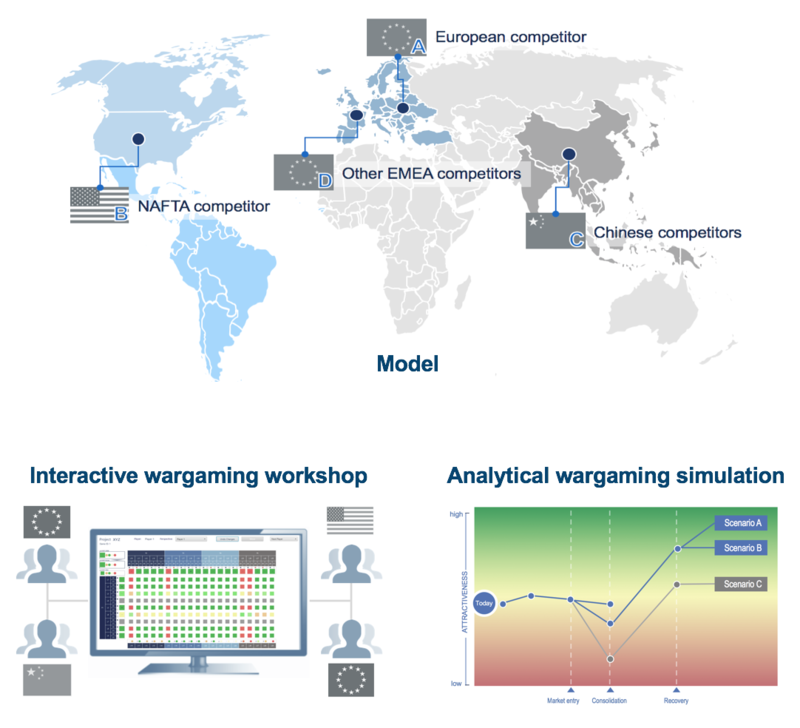 Second, in our interactive wargaming workshops, we enable our clients to put themselves into their competitors’ shoes and to play the conflict at hand from multiple perspectives to experience the strategic interactions driving the market, also using a computer simulation of that specific conflict. In any of these fundamental situations, Straint supports you with quantitative analytical methods , developing fact-based, action-oriented management recommendations for you.